The location and shape of the plot is the most important part of the building process because it what determines the nature of the synergy between the owner and the cosmos. 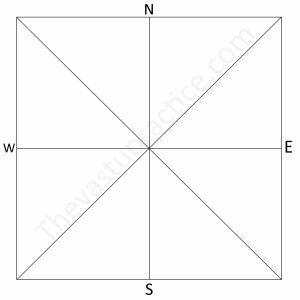 Plots which are oriented towards the cardinal directions are preferable. ie: North, South, East, West. This is called a Cardinal Plots. In this kind of a plot, the magnetic axis of the plot is parallel to the earth’s magnetic axis. 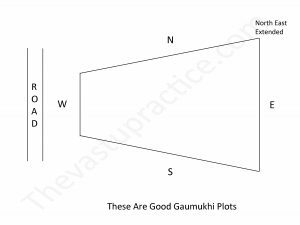 However when the cardinal directions come in the four corners of the plot, it is called a Vidisha plot In this kind of plot the magnetic axis of the plot makes an angle with the earth’s magnetic axis. 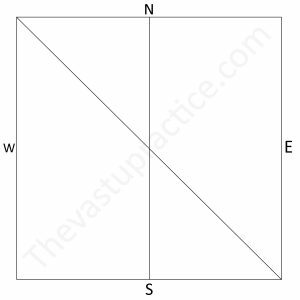 Square plots in which all four sides are equal and have all the angles of 90 degrees are the best plots. 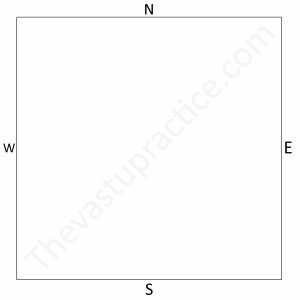 The Vastupurusha fits best in square plots and brings prosperity and happiness. 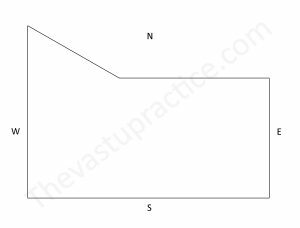 Rectangular plots in which opposite sides are equal and all four angles are 90 degrees are also very good plots. The ratio of width to length should not be more than 1:2. 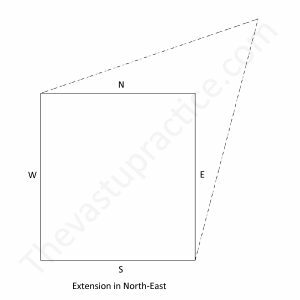 If the East-West axis is longer than the North-South axis, it is very auspicious. 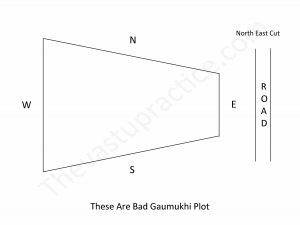 Plots which are narrow in front and broad in the rear are called Gaumukhi plots. Such plots are suitable for residence when the broad part is in the North-East and roads are on the Southern or Western sides. If the narrow part of the plot is the North-East then it is inauspicious. 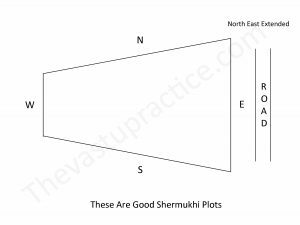 Plots which are broad in the front and narrow in the rear are called Shermukhi Plots or Vyaghra Plots. 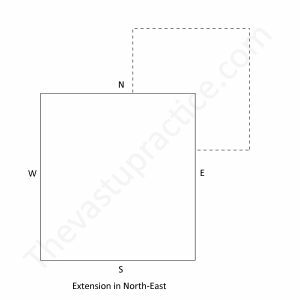 These plots are suitable for commercial purposes provided the broader part is in the North, thereby extending the North-East, and the road is on the Eastern or Northern side. 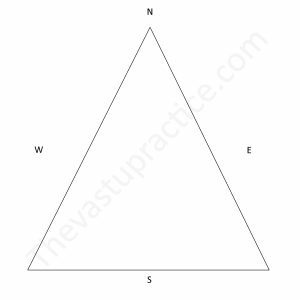 Triangular plot and other irregular shaped plots are inauspicious because they emit negative energy. 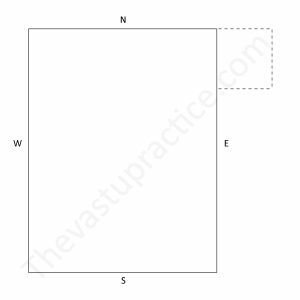 Owners of such plots should make the necessary Vastu corrections and try to make the plot into a square or rectangle. It thus follows that any reduction in these directions is very inauspicious. Some plots have a road that thrusts right into the face of the plot. This is known as Vithi Shool. 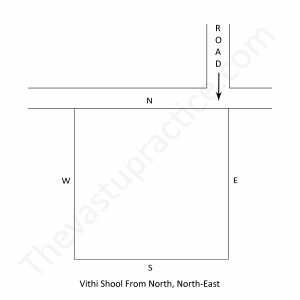 Vithi means road and Shool means arrow. This kind of a road points concentrated energy into the site. This energy can be positive or negative depending on the direction from which it is coming. It is positive only when it is coming from the North-North-East or East-North-East. A plot with roads on all four sides is most auspicious for residential and commercial purposes. 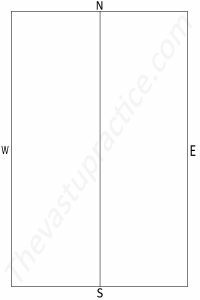 Doors can be fixed on all four sides in the auspicious grids. 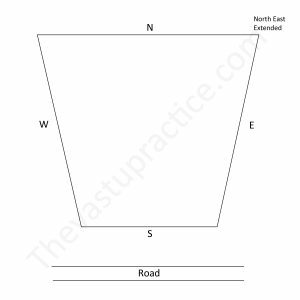 A plot with roads in the North, East and West with the South closed is auspicious for residence and commercial purposes. A plot with roads in the North, South and East with the West closed is good for commercial purposes. A plot with roads in the East, West and South with North closed is good for residence and for commercial ventures run by women. 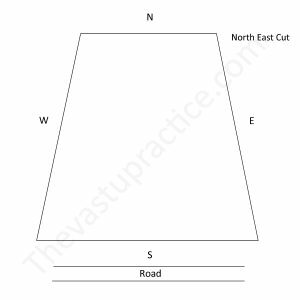 A plot with roads in the North, South and West with East closed is good for commercial purposes but a medium category for residence. 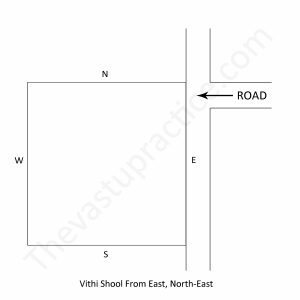 A corner plot with roads in the North and East are excellent and auspicious plots. These are called Eshanya plots. 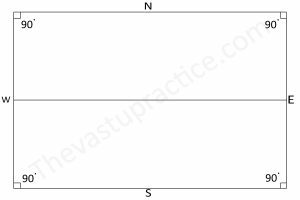 A corner plot having roads in the North and West are Vavaya plots. 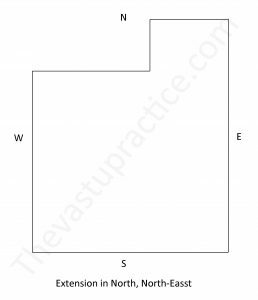 Care should be taken that the South-West corner of the plot is higher than the North-East and construction is done according to Vastu principles. 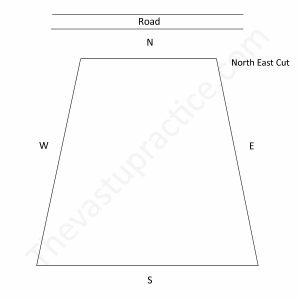 A corner plot with roads in the South and East are called Agneya plots. These are not good plots. The excess of fire element in this plot leads to financial and other mental problems and is especially bad for women. 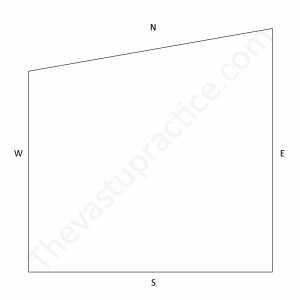 A corner plot with roads in the South and West are called Nairutya plots and are to be avoided. 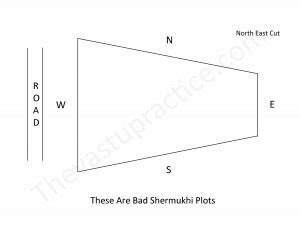 A plot with roads in the East and West with the level of the road and plot lower in the East is a medium category plot. If the level of the road and plot is lower on the Western side then it should be avoided. 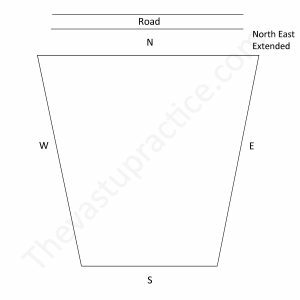 A plot with roads in the North and South with the level of the road lower in the North is a medium category plot. If the level of the road is lower in the South then it should be avoided. 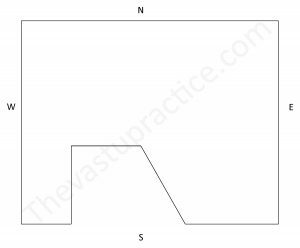 A plot with a road in the North and the plot and road sloping toward North-East is a medium category plot. 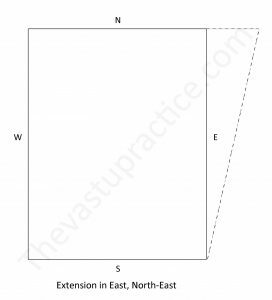 A plot with a road in the East with plot and road sloping towards North-East is also a medium category plot. A plot with a road in the South is good for business run by a woman and for any entertainment business. A plot with a road in the West is better avoided. Avoid a plot that is in proximity to any religious building like a temple, gurudwara, church etc. If the shadow of a temple falls on a house it is very inauspicious. There has to be a distance of at least 100 meters. Avoid buying a small plot between two large plots. Mountains and hilly areas in the south and west are good. Avoid buying a plot close to a cremation or burial ground. There should not be any high tension wires above the plot nor any Vedhas in front of the plot like an electric pole, tree, pillar etc.